According to the US Bureau of Labor Statistics, the District of Columbia’s private sector employed 526,533 wage and salaried workers in June 2015 (averaged over three months). This June level was 7,267 (1.4%) above that of the prior year, a positive indicator of continued growth in the District’s economy. 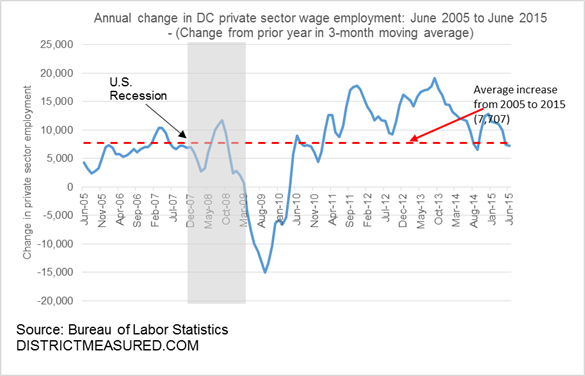 The June employment level may also be a sign that the rapid increase in D.C.’s private sector employment that has occurred since the end of the US recession is slowing down. 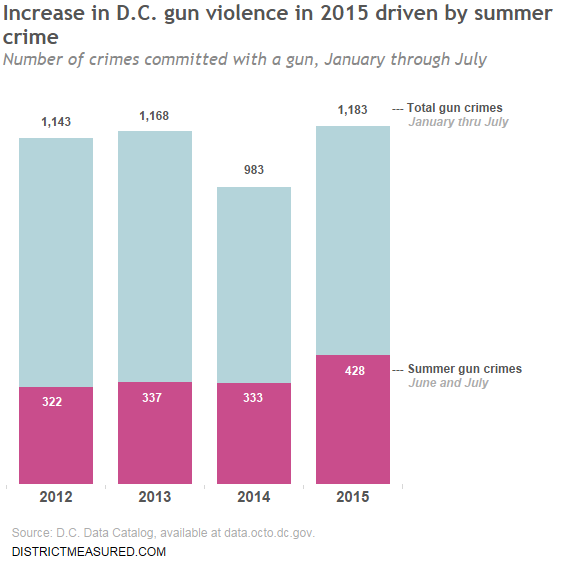 June was the second-slowest year-over-year increase since January 2011 (the other was 6,500 in September 2014). DC’s private sector job growth in June was about at the level that occurred before the recession’s onset, and was slightly under the average annual growth for the past decade (7,707). Weaknesses in DC’s private sector are not economy-wide. Indeed, four of the District’s major sectors, ones that account for over half of all private sector jobs (professional services, business services, health, and organizations), added 9,067 jobs from June 2014 to June 2015, more than twice as much as in the previous year. The weakness came primarily from six sectors that together account for a little more than one-third of all private jobs: education, food services, accommodations, retail, information, and finance. Those sectors grew by about 6,600 from 2013 to 2014, but they fell by 1,900 in 2015. What exactly is this data? The data is from the Bureau of Labor Statistics’ monthly data release on employment by industry area. All numbers are three-month moving averages of seasonally unadjusted data. 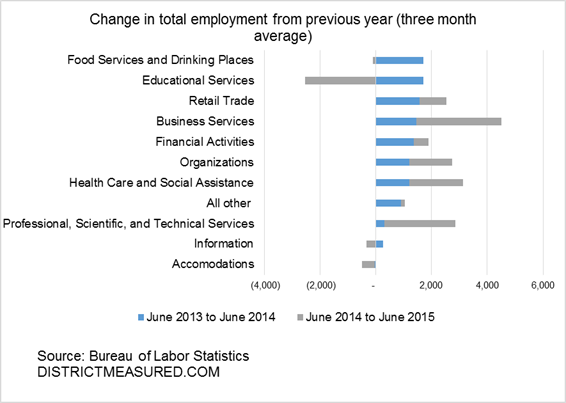 This means the numbers for June of 2015 is the average of the monthly employment figures for April, May, and June. The U.S. Census Bureau defines a building permit as the approval given by a local jurisdiction to construct new privately owned housing units. Because building permits precede construction, they are often seen as a leading indicator for the residential construction industry. Most of the construction begins the same month the permit is issued and the remainder usually begins during the next three months. Since the housing market is also believed to be one of the first economic sectors to rise or fall when economic conditions improve or degrade, building permits are often used as an indicator for the economy as a whole. 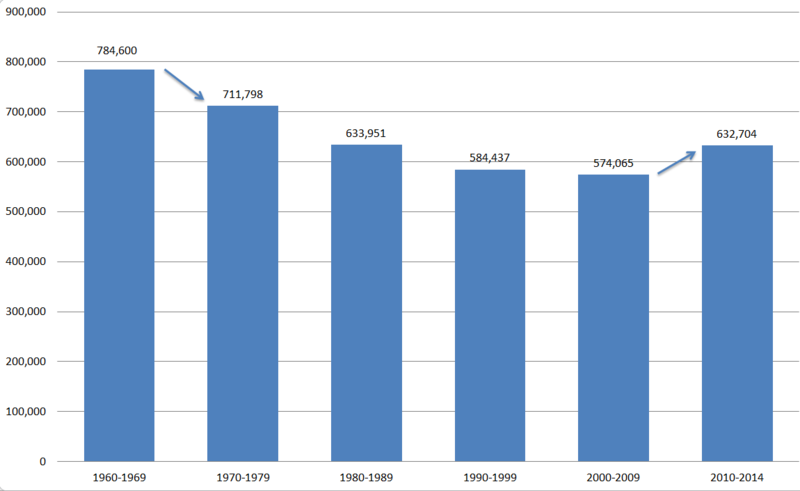 The number of building permits issued in the District has fluctuated substantially over the last 50 years. During the District’s most expansive years in the early 1960’s population grew rapidly and construction of residential buildings reached historic highs. Things took a turn in the latter part of the 1960’s, as fewer people chose to live in the District and fewer permits were being issued. This negative trend sustained for decades, until the turn of the century. Now we once again seem to be heading towards record high residential construction in the District. Conclusion: The District is currently experiencing its most expansive phase since the 1960’s, with regards to both population and construction of new residential buildings (measured by building permits). More permits are being issued than ever before and population has now reached the levels of the late 1970’s. This may very well be an indication of a strong, growing economy in the District in the years to come. Building permit data is from the United States Census Bureau (www.census.gov). Population data is from the Bureau of Economic Analysis (www.bea.gov). Ginger Moored contributed to this post. How many businesses and which types of businesses are owned by women? DC compared to the nation. The U.S. Census Bureau released preliminary figures today on the characteristics of businesses ownership in the nation based on 2012 data from the Survey of Business Owners. In this post we examine how many businesses are owned by women, comparing DC to the nation and examining how these figures have changed over time. Though women comprise the majority of the nation’s (and the District’s) population, women are still a minority in terms of owning a business. Here’s what the data show for DC, the nation and the four largest states. In the District, almost 45 percent of non-publicly owned businesses are owned by women. This is significantly higher than the nationwide average of 36 percent. If these preliminary estimates hold up, this represents a considerable increase in female ownership since 2007, when 37.5 percent of businesses in the District were owned by women. Even taking into account the fact that the District has the highest female to male population ratio among states, almost 53 percent versus 51 percent in the nation overall, the female ownership ratio in DC still stands out. 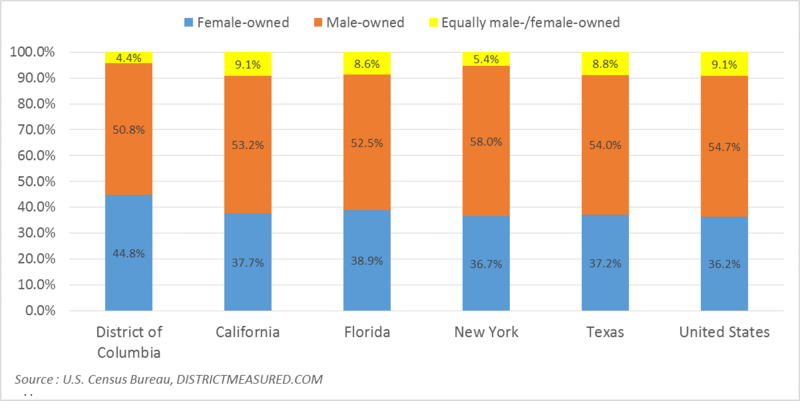 Interestingly when it comes to joint female/male owned ownership, the District share is considerable lower than the nationwide average and the other states. This may have to do with the relatively low presence of smaller mom and pop shops in denser urban areas like DC. Looking at what types of business women tend to own, among the major sectors, health and education topped the list. For these types of businesses, women-owned businesses actually represented the majority. Ownership of management holding companies, construction and transportation tended to be male dominated. The sectoral composition of DC’s economy, towards service sectors where women are more likely to own businesses, also explains why female ownership is higher in the District compared to the nation. We will provide further updates on this data including characteristics of minority owner businesses and metro level data. Data are based on the 2012 Economic Census, and the estimates of business ownership by gender, ethnicity, race, and veteran status are from the 2012 Survey of Business Owners. Detail categories will not sum to the total because the ‘publically held and other firms not classifiable by gender, ethnicity, race, and veteran status’ category is not included in the preliminary tables. For further details on methodology and data issues click here. These data are preliminary and are subject to revisions. The Federal government’s presence in the DC property market: Q&A on the impact of the Federal “Reduce the Footprint” policy on the commercial real estate market. In March of this year the Administration enacted the National Strategy for Real Property (National Strategy) and the Reduce the Footprint (RTF) policy. This directive expanded the scope of the prior Freeze the Footprint policy, which required all Federal agencies to freeze their real estate footprint. As stated in the press release, “With the establishment of the National Strategy and OMB’s new Reduce the Footprint (RTF) policy agencies will be required not only to continue to freeze but also reduce their real property footprint over the next several years. ” In addition to the Federal government, foreign governments have seemingly adopted a similar policy to reduce their footprint and capitalize on their real estate holdings as evidenced by the conversion of the former Italian embassy in DC to condominiums and other similar real estate dispositions by foreign governments. In this post we conduct our own Q&A to analyze the potential impact of this policy on the commercial real estate market and to analyze the broader market of tax-exempt properties. Q: To what extent has the District’s economy diversified away from the government sector and been able to absorb the space that resulted from the reduction in the government’s footprint? A: In 2005 private sector employment accounted for 66 percent of all employment in DC. Today it accounts for 69 percent of total employment. Over this 10 year time frame, the private sector added 78,000 jobs while the Federal government added only 3,500 jobs. The sequestration had a large impact on Federal employment which experienced 3 consecutive years of declines beginning in 2011. More recently, Federal employment has stabilized. This is good news for the District’s economy but looking forward the private sector will still be the major engine of growth. Q: What are some examples of former Federal properties that have been converted or occupied by private tenants? A: Notable recent examples of this diversification include the conversion of the Old Post Office to a hotel and the planned redevelopment of the FBI headquarters building. Both of these properties are on prime real estate on Pennsylvania Avenue. In some cases, rather than dispositions and conversions, Federal agencies have relocated within the District, but the net effect has been a reduction in the Federal government share of the overall market’s footprint. Q: What effect has this diversification had on the District’s real property tax base? A: Concurrent with this shift in the employment base has been a decline in the share of market value of tax-exempt commercial properties as shown in the graph below. The market value of tax -exempt commercial properties, 49 percent in 2005, has declined to 47 percent in 2015. Q: What has the impact on tax revenues been? A: While a two percentage point increase in the share of taxable properties is small, this change represented almost $3.5 billion dollars in market value and accounts for $59 million dollars in annual tax revenue. This isn’t to say that by virtue of the Federal government reducing its footprint, revenues will necessarily increase. Someone has to occupy this space and while some Federal properties may be highly desirable and a target for conversions (like the Old Post Office), other properties which lack amenities or floorplates suited for today’s office market, may languish on the market. Q:The District still has a very high share of tax-exempt properties. What agencies, or who, accounts for this large share? A: The Federal government still accounts for the lion’s share of tax-exempt properties with 59 percent of the overall market value. The other large tax-exempt sectors are not-for-profits, which include educational institutions, and make up 23 percent followed by the DC government, which accounts for 15 percent. Foreign governments hold 3 percent and public authorities like WMATA account for 1 percent. Q: Is the presence of such a large share of tax-exempt properties unique to the District? A: Surprisingly no. New York City for example has an even higher share. 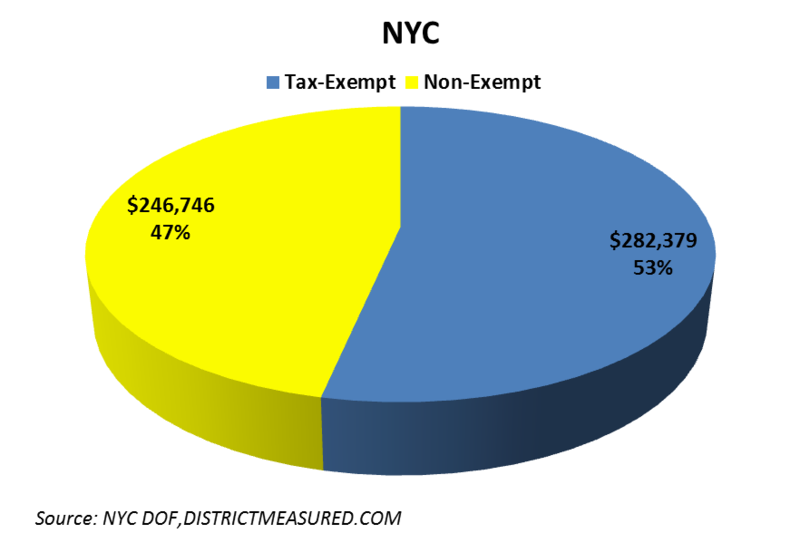 Almost 53 percent of market value in New York City is tax-exempt, higher than DC’s 47 percent. The sectors that account for this, however, are very different from those in DC. Q: How can New York City have a higher share than the District which is the seat of the Federal government? 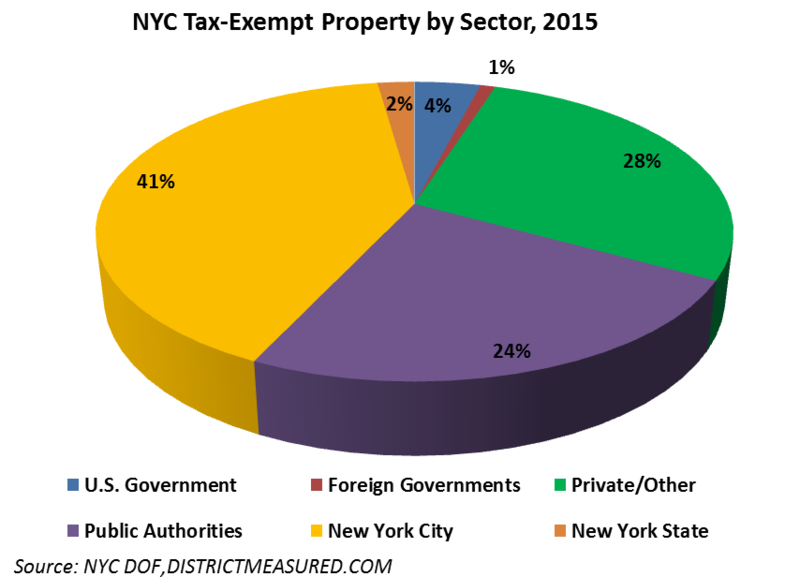 A: Indeed the Federal government’s share of tax-exempt properties in New York City is far lower than in DC. However, public authorities, like the Port Authority of New York and New Jersey, which owns airports, land and properties including the World Trade Center site, have a much larger presence there than in DC. Even the land that was excavated from the World Trade Center site was used to create Battery Park City, owned by another public authority, the Battery Park City Authority. Q: Do the District and the DC Area still have greater exposure to the Federal Government Reduce the Footprint policy, at least for office properties? A: Yes the direct impact of this policy is likely to be greater in DC and the surrounding area than in other large office markets. The indirect impact of this program and Federal budget cutbacks is broad based and felt throughout the nation. Transit agencies face huge funding needs for their capital programs. To the extent that the Feds are cutting back on funding, local authorities and government increasingly have to capitalize and sell their real estate holdings to finance these needs. We will have to see the details regarding the implementation and timing of this program. The pace of implementation, the quality of space being put on the market and the strength of private sector office using employment will all be critical factors in determining the impact this program will have. In some cases this could be a real opportunity for the private sector to step in to reposition or redevelop government property. 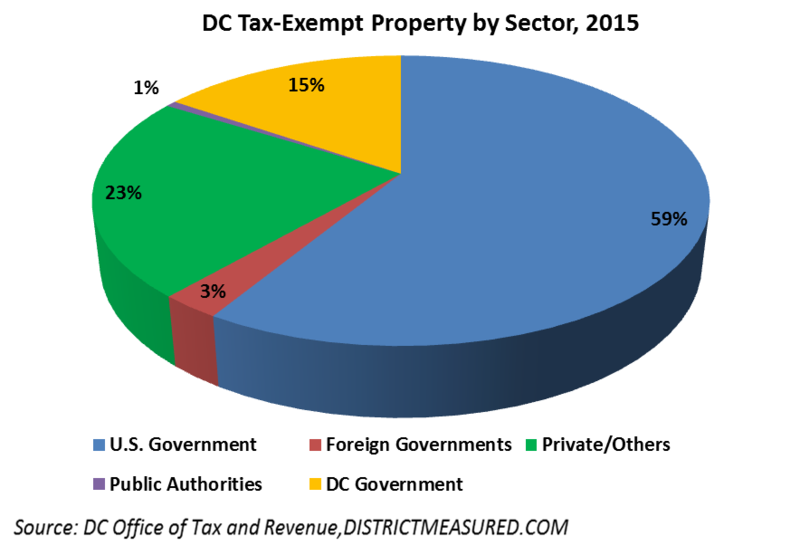 DC property tax data is from the DC Office of Tax and Revenue. New York City data was obtained from the NYC Department of Finance annual Property Tax Report. NYC market values were calculated assuming a similar ratio of market value to tax for non-taxable and taxable values. We know that the DC metro area is home to a greater share of college graduates than the nation as a whole. We’ve been wondering, though, how the education levels of District residents have changed as the city has gained more residents and seen changes in its job market. We looked at educational attainment in the District since 2008 and found that while the portion of residents with a bachelor’s degree has remained about the same, there has been a meaningful increase in the percent of residents with a Master’s degree. In 2008, 15 percent of District residents had a master’s degree. That number increased to 19.5 percent by 2013. This increase was greater than the increase nationwide. The District now has a greater proportion of residents with a master’s degree than Montgomery County and is closer to Fairfax County than in 2008. The interactive chart below can show other local educational attainment trends too. Educational attainment was found using American Community Survey (ACS) data. ACS data is provided by the U.S. Census Bureau. Educational attainment is defined as the highest level of education attained by an individual. The reason for choice of surrounding counties has to do with population size and related margins of error. The reason for choice of years has to do with a survey question change that would have made comparing data prior to 2008 less reliable.